The narrative of victims of terrorist and criminal violence in Northern Ireland is under attack from many directions and must be combated going forward, an audience in Fermanagh has been told. Kenny Donaldson, director of services of the South East Fermanagh Foundation (SEFF), made the point in a speech about future vision during its 20th anniversary service at the Archdale Hall in Lisnaskea on Tuesday night. SEFF now has 17 staff and 110 volunteers serving 1,020 members and associated family members and supporters across NI, the Republic of Ireland, GB and Spain. “Ruth Dudley Edwards paid us perhaps the best compliment anyone ever has when she spoke of her pride in addressing a meeting by ‘a wee group from Fermanagh which punches well above its weight’,” Mr Donaldson told those gathered to celebrate their journey over 20 years. 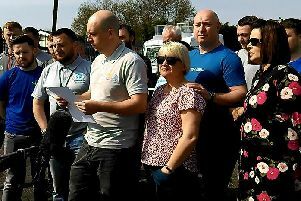 Among those attending were victims and their supporters from across the British Isles, elected representatives, senior civil servants and journalists. The service was conducted by Rev Alan Capper and Rev Alan Irwin, interspersed with prayers, hymns, readings and the SEFF Youth Choir, which is made up of young people who lost loved ones to terrorism. Mr Donaldson added: “SEFF is a family of diverse individuals who all share a commonality, a principle which is not for sale; that being that the sanctity of human life must be protected and that it is not for any man or woman to take the life of another through an act of premeditated terrorism or criminal violence. SEFF is now an international network, he said, which is about legacy building, education, influencing government policy and delivering for “the innocent victims and survivors of terrorism and other Troubles-related criminal violence”. The organisation has recently opened offices in London and Newtownstewart and is considering another in south Down. SEFF chairman Eric Brown said that the organisation began with three people in his house only hours after the Omagh bombing in 1998.